Pascal’s wager, or gamble, is a theological idea for believing in god that was invented by the seventeenth century French philosopher and mathematician, Blaise Pascal. Pascal basically asks you to view the beneficial properties of believing in god: If you believe in god and there is a god, you gain infinite reward. If you believe in god and there is no god, the worst that can be said is that you might have forsaken some finite rewards in life. On the other hand, if you disbelieve in god, and god exists, you risk infinite punishment, whereas if you disbelieve in god and there is no god, you have only finite rewards to show for it. Through simple probability theory – which we can, in fact, credit Pascal for inventing – you would be better off believing in god. The wager is quite a useful religious tidbit because it cuts through much of the theological red tape and gets straight to the point of whether or not it is advisable to believe in god. Though the logic it employs is quite flawed, it should be applauded for promoting the idea that religious belief ought to comply with reason and probability theory instead of simply relying on faith. 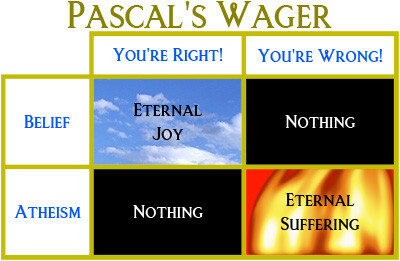 This wager tends to pop up in one form or another quite often – pretty much every time you are told you have to believe in one thing or another because “you never know”, or “why risk it?”, you are in effect being introduced to Pascal’s wager. And since it keeps coming up so often, dismissing it can become quite useful. The most common attack against the wager is that there is a big difference between actually believing and only claiming to believe. The point being that to simply claim to believe in god is no more than an act of hypocritical trickery – one which no omniscient deity could fail to notice. Having well anticipated this objection, Pascal’s reply is actually quite impressive in its honesty, even if this honesty does little to counteract its sheer silliness. He admits that a person should not, indeed – cannot, trick the deity, but he claims that one should use the profession of belief as a catalyst for honest and logical inquiry into the matter, which, according to him, would logically lead a person to sincere belief. Pascal actually spends a bit of time explaining how disbelief is an illogical position – a condition of irrational passion that can and should be reined in by means of logical inquiry. But anyone who is at all paying attention would be logically compelled to ask what the initial “belief” could possibly be based on if inquiry and proof only come later. Should we simply take Pascal’s word for it? This is a classic case of putting a broken down theological cart before an old and confused horse. Yet another rebuttal Pascal anticipated is the one about other religions making the same claim about other deities – thereby making it impossible to determine which deity should be believed. Pascal’s reply to this argument is quite similar to his first one – diligent logical inquiry into the subject will reveal that the Christian god is the only one to be believed. Pascal never really elaborates about this inquiry; thereby revealing just how subjective and circular it is. No external data, nor measurable values, nor methods of inquiry, nor even any objective measurement of success, save for Pascal’s opinion that when you get to Christianity, you’ll know you’ve succeeded, is ever provided. Far from being an objective means for getting at the truth, Pascal seems to think that this problem can be solved by simply restating it in a different way. Indeed the entire premise of this wager suffers from the same dizzying circular reasoning – you should believe god exists because he exists, and if you cannot believe it, you should inquire into it until you realize he exists. As you can see, the premise and the conclusion are identical, and no external information is allowed to enter this spiralling silliness. Consider also that Pascal simply asserts that god will punish disbelief and reward belief. It is embarrassing easy to notice that this is a completely unsupported premise, but before you even get a chance to point this out, you are quickly bombarded with probabilities and conclusions, as if all the logical work of establishing the premise had been done by asserting it in the first place. So there we have it – a “wager” that begins with substituting evidence for desirability (textbook self delusion), and then, by means “logical inquiry”, essentially doubles down on the silliness; claiming that belief should precede proof instead of the other way around.